This volume presents Lovecraft’s correspondence with Maurice W. Moe, who knew Lovecraft for nearly the entirety of the latter’s adult life, from 1914 to 1937. Moe, a high school teacher in Wisconsin, was a devoted amateur journalist and also a fervent and evangelical Christian, and both subjects elicited sharp discussions from Lovecraft. The Providence writer’s years-long assistance on Moe’s book about the appreciation of poetry, Doorways to Poetry, may have helped inspire his latter weird verse, including the Fungi from Yuggoth sonnets. The volume also contains Lovecraft’s extensive correspondence with Bernard Austin Dwyer, a weird fiction fan who engaged in wide-ranging discussions with Lovecraft on such subjects as cosmicism, Lovecraft’s upbringing, and political developments in the 1920s and 1930s. In addition, the relatively few surviving letters that Lovecraft wrote to the poet Samuel Loveman, as well as year-long correspondence with the noted bookman Vincent Starrett, are included here. As with other volumes, this book contains a fascinating array of writings by Lovecraft’s correspondents, ranging from Moe’s essay on “Life for God’s Sake” to a rare weird tale by Dwyer. The volume has been exhaustively annotated by David E. Schultz and S. T. Joshi. H.P. 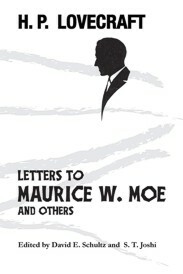 Lovecraft: Letters to Maurice W. Moe and Others.. By H. P. Lovecraft, Edited by David E. Schultz and S. T. Joshi. New York, NY: Hippocampus Press; 2018; ISBN 978-1-61498-218-0; paperback, 630 pages.